Interview: What’s happening in Greece after the Referendum? The “NO” victory in the Greek referendum showed that a majority of workers and youth rejected the terms of the bailout and oppose paying a debt that amounts to 180% of the country’s GDP. What are the possible scenarios after Sunday’s referendum? Interview with Manos Skoufoglou, member of the leadership of OKDE-Spartakos and of Antarsya Anti-capitalist Left Coalition. Laura Varlet, from Revolution Permanente , conducted the interview. Yesterday, more than 60 % of Greeks voted “NO” in the referendum. What does the vote mean for Greece? Manos: It is clear that this was a class-based vote. If you check out the data, it is pretty obvious that all the workers districts and towns voted massively against the agreement, that is, more than 70 %. And in all bourgeois areas in Athens for example, it was exactly the opposite, maybe 70 % or more voted “Yes”. The question in the referendum itself was not very clear –it was deceptive because it only referred to the proposal that the so-called troika (IMF, ECB and EC) made ten days ago. But it did not include the proposal of the government itself. So we could say that it was deceptive because if you voted “No”, then the government, and that is what they are doing now, will try to renegotiate. However, the referendum turned into a social and a class confrontation between the working class and the bourgeois class. And it also showed that the middle strata, that is, the petit bourgeois sectors, lost so much during the crisis that it is not worth it to be afraid of the collapse, the bank run, or the exit of the eurozone. So the lower sectors of the middle strata voted “No” along with the workers. What have been the objectives of Tsipras and the government thus far, and what do you think of the resignation of Yanis Varoufakis this morning? Manos: Tsipras’ government had not planned this referendum. They were obliged to call for a referendum because their negotiation tactics did not work. What Syriza was trying to do these last days was to find the way to distribute the burden of the new measures, that they would take anyway, in all social classes, so they were trying to tax the rich and the enterprises and at the same time they proceed to further cuts in wages and pensions, privatize ports and airports, increase the VAT, raise the age limit for retiring, etc. So they’ve already refrained from the commitment not to make any new attack against the working class, but they wanted to find a compromise to distribute the burden among all the social classes. However, the European Union, the bureaucracy and the technocrats from the bourgeois classes would not accept that because it was not only a matter of measures to be taken. The real thing is that they would not allow any kind of hope or illusion that people can avoid or scape the way of austerity. So they would pressure on the government and the government was in a difficult situation because they wanted to sign, this is pretty obvious, because they are afraid that the economic system will collapse and they are not willing to break with any rules of capitalism, as it could be for example the nationalization of banks immediately. They do not want to do that. They wanted an agreement but at the same time an agreement would have signified political suicide because people did not vote for them to take this kind of measures. So this meant no other way out than calling for the referendum. During the week, it was obvious that Tsipras was trying to find a compromise using the blackmail of the referendum, and in the middle of the week it was also probable that he cancelled the referendum in order to re-launch the negotiation. But fortunately, this did not happen and we had this big “No”. But again, this morning Tsipras called the leaders of the Parliament political parties, apart from Golden Dawn, to meet in order to talk about the next step. This means that they call not only the Independent Greeks, their right wing partner in the government, but also New Democracy and Pasok that supported the previous government, and also To Potami, which is a new capitalist party strongly supported by the European Union. Along with the right wing president of the Republic, they are trying to find a national unity solution, which does not necessarily mean a new government but it might mean a consensus about a new proposal to the EU. Varoufakis resigned, and this is a symbolic pressure that the European Union inflicted on the government. All this shows that the government will try to use the “No” for their own interest and the find a better position in the negotiations. But the problem is that this is not what people wanted because they voted “No” to all austerity. Yesterday after the results of the referendum were announced, thousands of people gathered in Syntagma square. What is the feeling of the people and what are they hoping for? Manos: Of course it is relief and hope what the people felt yesterday. People were hoping a victory of the “No” in the ballot, but they did not know that it will be that impressive with a difference of more than 20 %. They gathered in Syntagma and in other squares all over the country. It was a victory. Everybody felt relief that the former Prime Minister resigned from the leadership of his party, New Democracy. 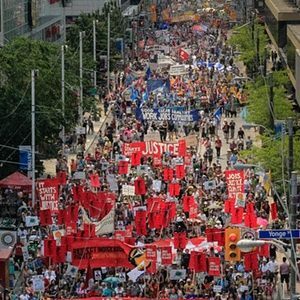 At the same time, the most conscious of the movement among workers already know that the next step would be difficult because government would go for a new round of negotiations and at the same time because of the blackmails that the EU and the bourgeois class would continue to make against the people. I know that the national union confederation of private sector workers, GSEE, declared their support for the “YES” campaign. What do you think about that? Manos: This is an important question because the bureaucracy of the national confederations has already been traitor many times in the past, but this treason is of historical importance. It is something different. In the past, they were against austerity measures in word, even if they did not do anything to fight against them and they always found the way to release the pressure and the anger of the people. But this is the first time that they openly took position by the side of the bourgeoisie. This is why we also organized a demonstration against their national headquarters in order to denounce them and their treason. However, there were some unions that took position against the national confederation, as the national federation of local government workers and some local unions as well. The national federation of school teachers denounced the decision made by the national confederation. On the other hand, the union of the workers in banks supported the “Yes” and many other unions did not take any position. So this means that the working class had to confront at the same time the alliance of all the bourgeois parties that cooperated for the “Yes”, all the private mass media that has terrorized people, the EU, and at the same time workers had to confront the bureaucrats of the national confederation, and this made the victory of the “No” even more glorious. This makes our duty to keep a real “No” and do not let the reformists and social-democrats of Syriza slide towards a different “Yes” even more urgent and important. Are there some sectors of the working class and the youth that are living through the experience with Tsipras and the Syriza government and that want to take the fight against the Troika and austerity further? Manos: I think that Syriza and Tsipras are still popular among the popular strata. But at the same time, there are sectors of the militant vanguard that realizes the limits of the government. There are sectors of the movement that I hope will try to avoid the government betraying in the next days. Or even if the government betrays and signs an agreement, I hope that there will be those sectors, or part of them, to create an alternative to Syriza from the left. At the same time, the Communist Party has totally ridiculed itself by calling to abstention. According to some polls, more than 2/3 of their voters did not follow their voting instructions. Then, there is a strong possibility that some people split with the Communist Party and with Syriza and start looking for an anti-capitalist alternative. And there are some good signs about that. On Thursday, for example, anti-capitalists and the far-left organized a big demonstration in Athens calling to vote for “NO”, but also against any agreement and against the EU. This demonstration got together more than 5,000 people. What do you think about the left platform within Syriza? Did they take position on the negotiations and the attitude of the government? Manos: The first thing to say is that the government is quite autonomous from the party. For instance, even the political secretariat of Syriza learnt about the referendum on TV. This means, first of all, that the party cannot control the government. Even if the left of the party could take over the party, they could not take over the government. But I do not think that taking over the party is possible anyway, because the leadership of the left platform is in the hands of former sectors of the Communist Party that have entered Syriza, headed by Lafazanis, who is a Minister in the government and he is highly enthusiastic about the recent choices of Tsipras, so the referendum has managed to incorporate, at least for the time being, the leadership of the left platform. If they have to vote for austerity measures there might be some deputies who will vote against. But I do not think that Syriza can be changed from the inside and I think that the left platform had very few initiatives during for example last week. Despite the fact that we cooperate with them in several cases, then at the end the commitment to Syriza’s discipline blocks. A few weeks ago, there was a strike in the hospitals and it was the first big strike against the government and they voted against the strike. What was the “NO” campaign like? Which was the role of the anti-capitalist left in the campaign? Manos: The first thing to say is that despite the disagreements that exist within Antarsya, and we do not hide them, I think we played a very important role in the campaign for the “No”. 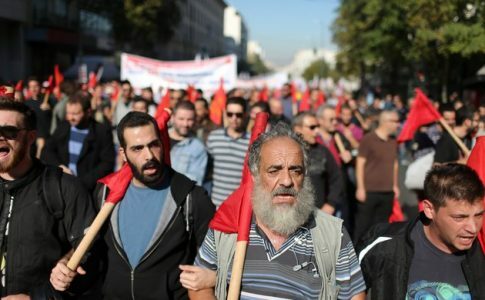 The militants of Antarsya organized many demonstrations, activities and protests in work places, in mass media head-quarters, in the national confederation of private sector workers, in the head-quarter of the EU in Athens, etc. Apart from that, what we tried to do was to participate in the massive demonstrations in the center of Athens along with everybody and we also organized the radical demonstration on Thursday. It was a short time so, apart from some specific cases, it was not possible to form local united committees for the “No” campaign. Anarchists and anarcho-syndicalists participated in the campaign as well, which is something new because they are usually for the boycott. We coordinated in action with all the forces that wanted to do it, but at the same time the anti-capitalist and revolutionary left had its own slogans. Now, what we are trying to do is prepare ourselves because we will probably have to organize a demonstration this week against a new agreement or at least against the attempt to sign a new agreement. Our slogan now is “No up to the end”. We organized a counter-demonstration against the reactionary big demonstrations for the “Yes” in the center of Athens last Thursday, and we did it with some other far-left groups, because Antarsya did not agree as a whole. I think our group played an important role with some important initiatives and we will continue to do so. What does the Greek left say? 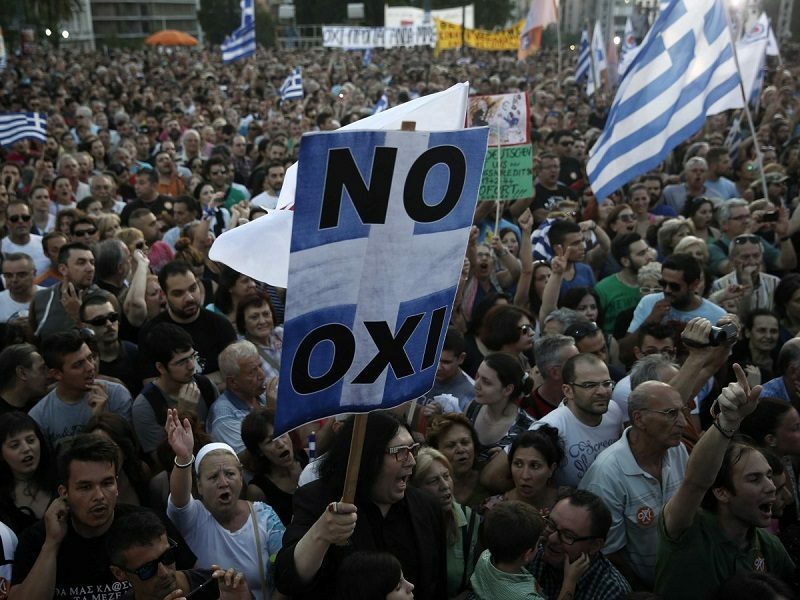 The Greek people have said NO to the adjustment measures. Now it is time to organise the struggle to defeat the Troika.